Support the council’s mission and vision. Help the council achieve its Journey to Excellence goals. To find and encourage Eagle Scouts to become active resources for the council leadership and programs. Recognize Eagle Scouts, Venturing Scout Summit and Sea Scout Quartermaster Scouts for their achievements. 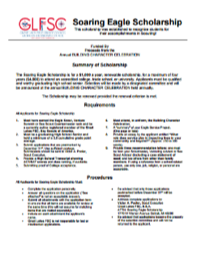 Recognize Scholar Scouts through the Soaring Eagle Scholarship. Recognize Outstanding Eagle Scouts for their contributions in Scouting and their Community. Recognize Outstanding Alumni for their achievements in promoting Scouting and their ability to reconnecting Scouting Alumni. Establish networking opportunities for our members through social gatherings, community and camp service experiences. 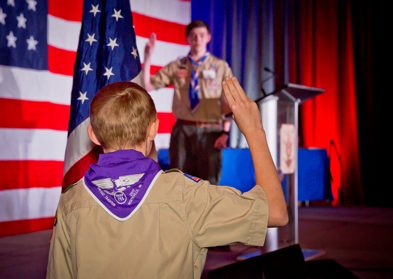 The purpose of the Building Character Celebration (Eagle Dinner) is to recognize Scouting’s outstanding youth who have achieved the rank of Eagle Scout, the Venturing Scout Summit or Sea Scouting Quartermaster Awards. Introduce Scouts to positive adult role models who share an interest in a selected career field. Provide an opportunity for businesses to foster a relationship with our future leaders. Offer a one of a kind experiences for all that attend. Offer an annual Eagle Scout reunion for all that live in Oakland, Macomb and Wayne Counties. More information can be found by clicking the link in the calendar. 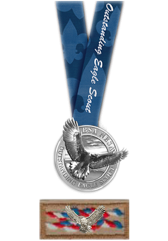 The Soaring Eagle Scholarship was established to recognize a scout for their efforts in both academics and scouting. This can also include extra activities that they are participating in. A single $1000.00 scholarship is given per year but can be renewed annually. Only Eagle Scouts, Venturing Scout Summit and Sea Scout Quartermaster recipients may apply during their senior year. Download form from the useful forms section. Deadline for all applications need to be received by December 31st of each year. NESA helps Eagle Scouts as they move on to the next stage of life. Education is a valuable tool for a young person regardless of what kind of career he chooses. Yet, finances can be a big hurdle in attaining the necessary knowledge for one’s future vocation. Fortunately, NESA assists Eagle Scouts with their educational pursuits whether it be at a four-year university, vocational trade school or field study opportunities. In 2017, the NESA Scholarship fund awarded $755,000 to Eagle Scouts. If you are an Eagle Scout and you are looking for funds for post-secondary education, you have come to the right place. Click Here to learn more. Deadline for all NESA Scholarships is October 31st of each year. Given to both Eagle Scouts and Girl Scout Gold Award recipients that are registered in Educational Program at Wayne State University in Detroit. The scholarship is awarded annually and must be applied for each year. This scholarship must be applied for in person to qualify. Direct all inquiries to the Wayne State University Admissions office when you register for classes. For more information on this scholarship, use the useful forms link. Submit an Application for Admission to Henry Ford College in the Fall of year planning to attend. Provide a one-page, single spaced essay outlining why the student wants to attend Henry Ford College. The Scholarship Award may be used for tuition, fees, books and/or supplies. For more information on this scholarship, use the useful forms link. This award is open to all Eagle Scouts who are currently registered in an active unit and have not reached their 19th birthday during the year of application. College plans do not need to be completed to receive the cash award. Money awarded at a National to State level range from $10,000 to $1,000. The competition is conducted in three phases, local (Chapter), State (Society), and National. The competition is usually entered through the Chapter level. In some cases, the competition may be entered at the State level. You may not enter at the National level. Applicants need to complete only one application. The application consists of the two-page application form, the Four Generation ancestor chart, and the 500-word Patriotic Theme essay. Deadline for this competition is due by February 15th of each year. Use the link to download both forms. The National Eagle Scout Association provides other links to Religious, Civic and Institutional Awards. Click on the links below to find out more. On or before December 31st of each year, an Eagle Scout, his parents, or any registered BSA volunteer (with the Eagle Scout’s permission) may submit his Eagle Scout service project for consideration. The Scout must have passed his Eagle board of review in the prior calendar year (January 1 to December 31). Each council NESA committee will choose one winner from among the council nominees. The winner will receive a certificate and a bronze device for the Eagle Scout embroidered knot from the National Eagle Scout Association. In addition, it is recommended that each winner’s name be added to a perpetual plaque located in the council service center or other prominent local council facility and provided by the council. All council winners will be considered for the Regional Eagle Scout Project of the Year Award. Council winners are encouraged to submit a link to an HD video about their project to the national NESA office. Regional NESA committees will select one winner for each region on or before March 31 each year. Regional award winners will be considered for the Glenn A. and Melinda W. Adams National Eagle Scout Service Project of the Year Award. 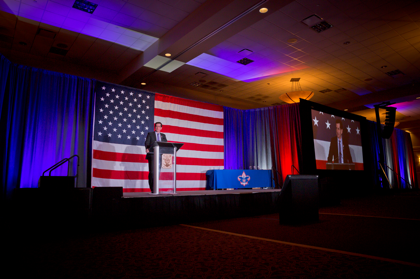 The three regional winners who do not win the national award will receive $500, to be available for their future educational purposes or to attend a national or international Scouting event or facility. The local councils of those three regional winners (not the national winner) also will receive a $500 award. All regional winners will receive a certificate and a gold device for the Eagle Scout embroidered knot. 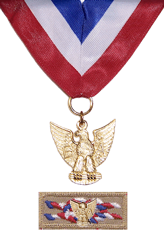 The Distinguished Eagle Scout Award was established in 1969 to acknowledge Eagle Scouts who have received extraordinary national-level recognition, fame, or eminence within their field, and have a strong record of voluntary service to their community. Only Eagle Scouts who earned the Eagle Scout rank a minimum of 25 years previously are eligible for nomination. The award is given by the National Eagle Scout Association upon the recommendation of a committee of Distinguished Eagle Scouts. Nomination are done through the ESMD Committee, if you would like to nominate an individual for the DESA, please contact Denver Laabs at denver.laabs@scouting.org. The nomination form can be found by clicking the link in the Useful Forms on this page. A list of past recipients can be found in the Useful Links on this page. 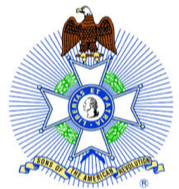 The NESA Outstanding Eagle Scout Award (NOESA) is a prestigious recognition granted by the local council’s NESA committee to Eagle Scouts who have demonstrated outstanding achievement at the local, state, or regional level. 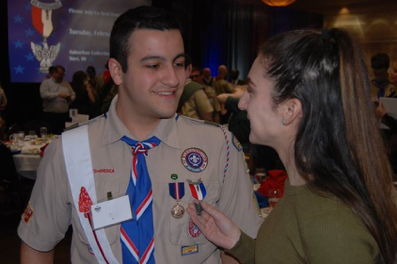 The NOESA recognizes Eagle Scouts whose efforts have made a positive impact in the community. Deadline for all nominations need to be received by December 31st of each year. Please e-mail to Denver Laabs committee staff adviser at denver.laabs@scouting.org. Please be sure to include a photo of the nominee in the application. The nomination form can be found by clicking the link in the Useful Forms on this page. A list of past recipients can be found in the Useful Links on this page. The Council Alumnus of the Year Award is different than other awards in Scouting as it does not simply recognize the individual for being a distinguished person or honor those giving time and energy to the BSA as a volunteer leader; Scouting already has awards that do that. It is more of a combination between the two. 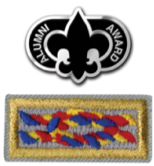 Scouting promotion, contributing significantly to the promotion and/or advancement of the BSA alumni program and activities at a council level over a sustained period through word and/or deed. Deadline for all nominations need to be received by November 15th of each year. Please e-mail to Denver Laabs committee staff adviser at denver.laabs@scouting.org. Please be sure to include a photo of the nominee in the application. The nomination form can be found by clicking the link in the Useful Forms on this page. A list of past recipients can be found in the Useful Links on this page. A recognition program to encourage participation and work in council alumni relations programs, including NESA activities; areas of work include alumni identification/promotion, alumni engagement, personal participation, and education. The form can be found by clicking the link in the Useful Forms on this page. Please e-mail completed form to Denver Laabs committee staff adviser at denver.laabs@scouting.org. Those of us who live by the Scout Oath and Scout Law understand the importance of Scouting. We became Scouting volunteers due because we believe in the character and building experience that the Scouting Movement provides youth. To commemorate the many years of dedication, Scouting Alumni and Friends developed a commemorative coin to celebrate the years of service that true Scouts have provided. The coin is accompanied by a lapel pin and certificate for 25, 50 and 75 years. This very special Bronze coin, for 25 years of Scouting, features the founder of Scouting, Lord Baden Powell. In addition, Scouting Alumni and Friends has developed some suggested ceremonies to mark the special occasion for the presentation. Recognize Scouting’s outstanding youth who have achieved the rank of Eagle Scout, the Venturing Scout Summit Award, or Sea Scout Quartermaster Award. Recognize the Soaring Eagle Scholarship recipient. Introduce Scouts to positive adult role models who share an interest in a selected career field. Provide an opportunity for businesses to foster a relationship with our future leaders. Provide a place to promote businesses, colleges, service organizations and scouting groups in a pre-event midway. Offer a one of a kind experiences for all that attend with a dynamic guest speaker with a festive atmosphere that all can enjoy. Recognize those Eagle Scout’s that have continued to support scouting in their daily lives, career and community with the NESA Outstanding Eagle Scout Award (NOESA). Offer an annual Eagle Scout reunion for all that live in Oakland, Macomb and Wayne Counties. Eagle Scouts, Venturing Scout Summit and Sea Scout Quartermaster award recipients are the honorees for the evening. Their meal is covered, which means they are 100% free. All they need is to be registered for the event. Parents, leaders, and friends of the honored scout are more than welcome to attend as guests for the event. The guest fee is $40.00 (per person) which includes dinner. Due to the nature of this event, there is no guarantee that you will be sitting with your Eagle Scout, Venturing Scout or Sea Scout. Each scout will be paired up with a mentor prior to the start of the event whom they will sit next to during the entire program. Our goal is to help foster a positive role model opportunity whom they can look to for future advice and guidance in their chosen field. Click here to Register your scout today. Eagle Scouts, Venturing Scout Summit, Sea Scout Quartermaster Award, NOESA recipients will also have an opportunity to have their picture taken. The council offers this normally for free at the council service center throughout the year. Prior and during the evening, scouts will have a chance to have their photo professional taken. These photos are displayed at the Dauch Scout Service Center all year. Please note, additional fees may apply depending on the additional packages being offered. Contributing a $100 will help cover the dinner cost for the Scout and mentor. Attending the dinner and sharing their profession with the honoree while fostering future conversation about their goals and career path. If not present, secures a mentor so no Scout is left without on for the evening. Inviting a Scout to visit your place of business is encouraged but optional. This will give each Scout a firsthand experience of their future career. Please assure that the Scouting Youth Protection (No one on one contact) is planned prior to the scout’s arrival at your business. One rule of thumb, if the scout is under 18, a parent or guardian must be in attendance and all e-mail conversations are copied to the parent while you are planning the day visit. Several companies host larger day visits for more scouts to attend, these allow for larger groups and offer a unique experience. Some have spent the day at a local radio station, automotive company and supplier and others spent the day working a audio visual company. This option has steadily grown of the past few years. If you see this as an option for your company, contact Denver Laabs at laabs@scouting.org, he would be happy to help you make the arrangements and send out personal invites to your company. We would like to secure a mentor for each honored Scout. To do so, we need an estimated 250 sponsors. You can help make a difference and set a tone for future success in this honoree life. Click here to Register. The following event sponsorships are being offered to cover operating and support costs: Click here to Register. 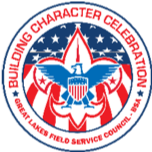 Full-page color ad in memory book, featured in press releases, featured prominently on the Great Lakes Field Service Council website, prominent recognition during event, 5 adult career mentors & 5 Scouts at front table with table signage. 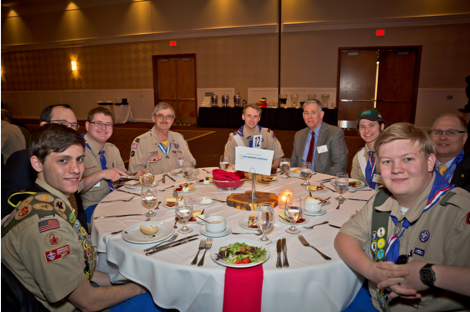 Full color page recognition in memory book, featured prominently on the Great Lakes Field Service Council website, event recognition, 4 adult career mentors & 4 Scouts at a table with table signage. Full color page recognition in memory book, event recognition, 2 adult career mentors & 2 Scouts at a table with table signage. Full-page recognition in memory book, event recognition, 1 adult career mentor & 1 Scout. Half-page color ad in memory book, 1 adult Career Mentor & 1 Scout. Half-page color ad in memory book. Parents and Family call out in the Memory Book (Personal business card size message to the Scout(s) from the parents, family, friends and leaders). Parents, leaders and friends are invited to attend as guests. Fee includes dinner. We do appreciate all your support with this very special event to celebrate Scouting’s highest award recipients. Click here to Register and be a part of this years’ celebration.